Kaptan Singh Solanki on Saturday took the oath of office and secrecy as the new Governor of Tripura in a simple ceremony at Darbar Hall of the old Raj Bhavan. 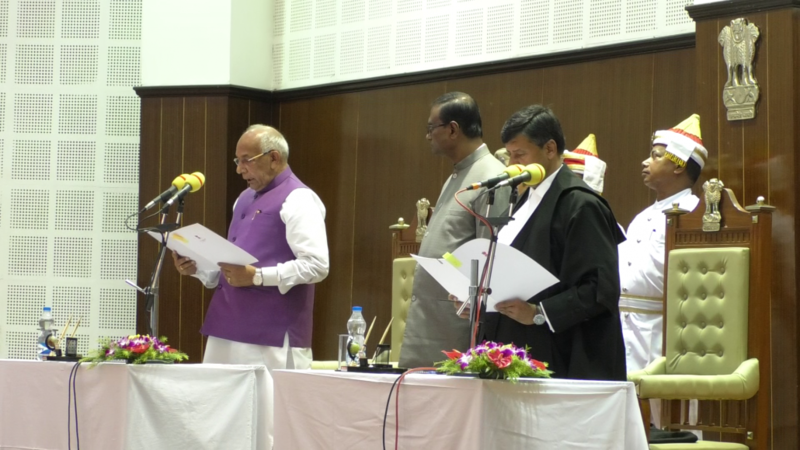 Solanki, who had served Haryana for a little over four years, was administered the oath of office and secretary by Chief Justice of High Court of Tripura Ajay Rastogi. Chief Minister Biplab Kumar Deb, his Cabinet colleagues Ratan Lal Nath, NC Debbarma, Mever Kumar Jamatia, Chief Whip Kalyani Roy and Chief Secretary Sanjeev Ranjan remained present in the oath-taking ceremony. After a brief swearing-in ceremony, the Governor was accorded with a guard of honor by the jawans of Tripura State Rifles. “The responsibility of a Governor is to follow constitutional provisions and I will do this with utmost care,” Solanki told the media shortly after the swearing-in ceremony programme. “Side by side, I will do whatever I can at my capacity to make Tripura a self-reliant and wealthiest State in the days to come,” he said. Solanki, who has a good rapport with RSS and BJP, landed the Agartala Airport on Saturday morning where he was offered Guard of Honour. The Chief Minister went to the Airport to receive the Governor designated.